Palau , officially the Republic of Palau (Palauan: Beluu er a Belau), is an island country located in the western Pacific Ocean. It is geographically part of the larger island group of Micronesia. The country's population of around 21,000 is spread across 250 islands forming the western chain of the Caroline Islands. The most populous island is Koror. 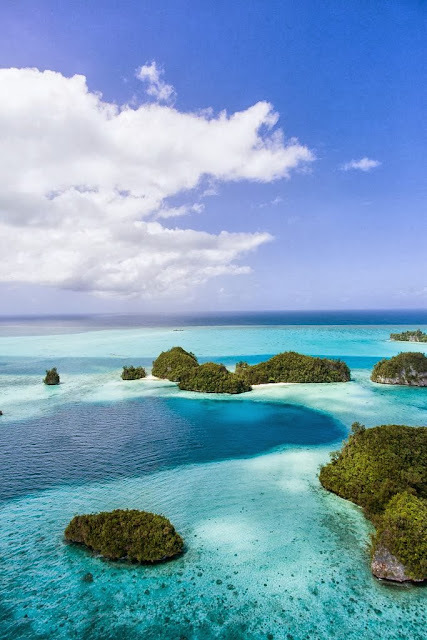 The islands share maritime boundaries with Indonesia, Philippines and the Federated States of Micronesia. The capital Ngerulmud is located in Melekeok State on the nearby island of Babeldaob. The country was originally settled around 3,000 years ago by migrants from the Philippines and sustained a Negrito population until around 900 years ago. The islands were first visited by Europeans in the 18th century, and were made part of theSpanish East Indies in 1885. Following Spain's defeat in the Spanish–American War in 1898, the islands were sold to Imperial Germany in 1899 under the terms of the German–Spanish Treaty, where they were administered as part of German New Guinea. The Imperial Japanese Navy conquered Palau during World War I, and the islands were later made a part of the Japanese-ruled South Pacific Mandate by the League of Nations. During World War II, skirmishes, including the majorBattle of Peleliu, were fought between American and Japanese troops as part of the Mariana and Palau Islands campaign. Along with other Pacific Islands, Palau was made a part of the United States-governed Trust Territory of the Pacific Islandsin 1947. Having voted against joining the Federated States of Micronesia in 1979, the islands gained full sovereignty in 1994 under a Compact of Free Association with the United States.